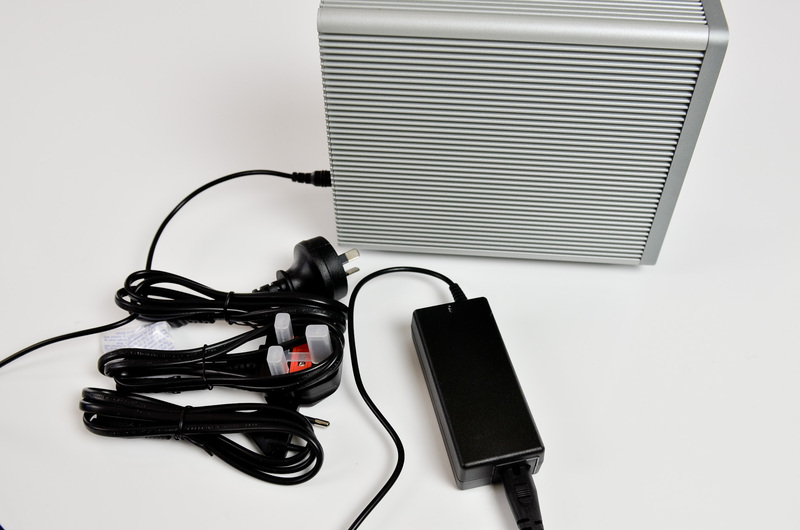 We've been covering Thunderbolt storage ever since the first Promise Pegasus hit our labs last summer. Since then we've noticed a common theme: Thunderbolt storage is very expensive. Prices haven't come down much at all, although LaCie has helped fill in the gaps left by Promise's $1000 and up Pegasus line. I honestly wouldn't expect prices on Thunderbolt storage to drop until the second half of the year when cheaper Thunderbolt controllers (Cactus Ridge) are available. Ivy Bridge is supposed to bring Thunderbolt to PCs, which should obviously broaden the install base and hopefully push vendors to come out with more affordable solutions. Thunderbolt is extremely important, particularly to the notebook-as-a-desktop usage model. Although SSDs have given notebook users desktop-like internal storage, external storage has often been painfully slow. The move to USB 3.0 helped address this, but thus far Apple hasn't adopted USB 3.0 in its machines. I suspect Apple will deliver USB 3.0 when it moves to Ivy Bridge in the coming months, but until then your options are limited if you've got a Mac. The fastest USB 2.0 devices are only good for around 40MB/s and FireWire 800 can deliver about twice that. 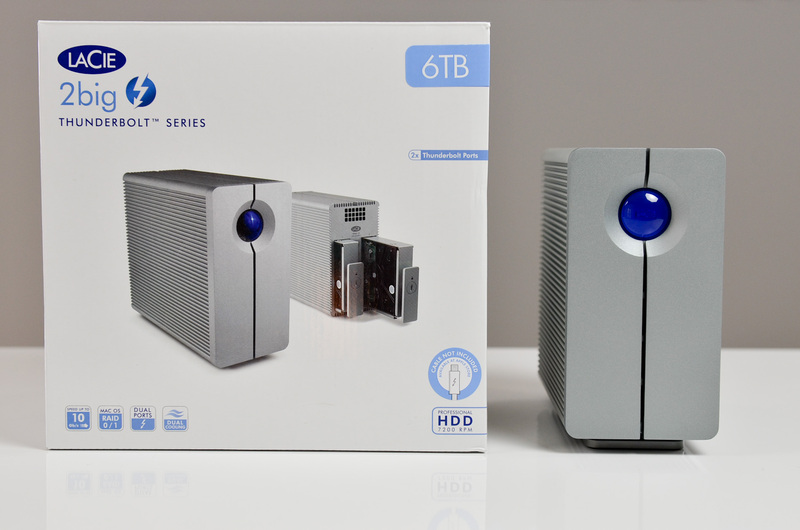 If you need high speed external storage on a modern (2011+) Mac, your best option is Thunderbolt. Thunderbolt's peak performance is very good. In our review of the Promise Pegasus R6 we measured 8Gbps of sustained data transfers from a four disk SSD array while driving a 27-inch panel, all over a single Thunderbolt cable. When it comes to storage, there's significant headroom in the interface. I don't believe Thunderbolt is quite fast enough to interface with a good high-end GPU, but it looks like we'll have to wait until at least 2014 to see that change. 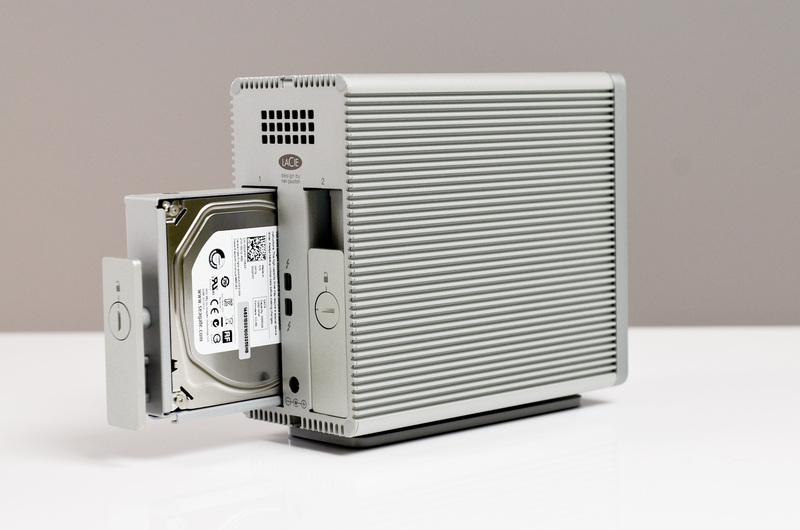 LaCie's first foray into the Thunderbolt storage space came with the Little Big Disk. 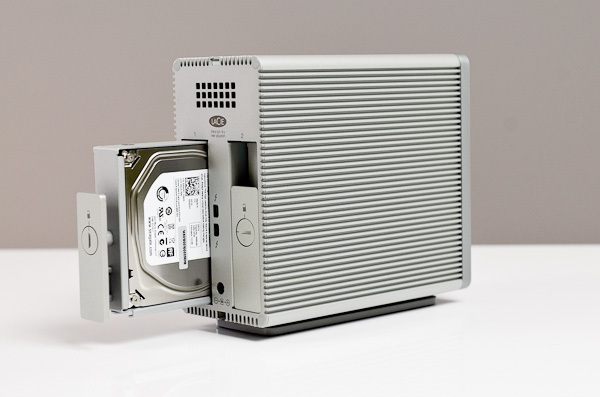 A hefty aluminum enclosure with two 2.5" hard drives (or SSDs) in a software RAID-0, the Little Big Disk hit price points as low as $399. If you need capacity however, you were left with Promise as your only option. Until now. 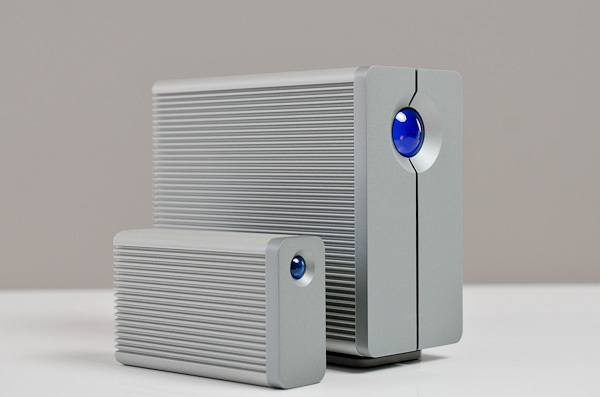 The 2big Thunderbolt series of drives are LaCie's latest additions to their growing Thunderbolt family. With a pair of 3.5" hard drives, again in software RAID-0, the 2big can give you anywhere from 4 - 8TB of external storage. Only the 4TB and 6TB drives are shipping today, priced at $649 and $799 respectively. Despite the higher total cost, the 2big drives actually have a lower cost per GB than the Little Big Disk as 3.5" drives are cheaper than their 2.5" counterparts. Although we saw both 5400RPM and 7200RPM drives used in the Little Big Disk, the 2big is strictly 7200RPM. 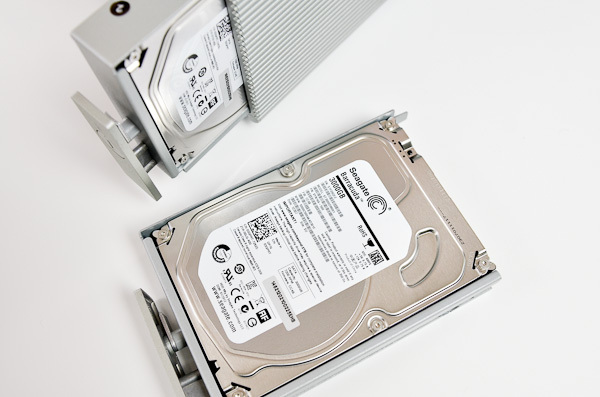 Our review sample featured two Seagate 3TB (1TB platter) Barracuda drives, although I wouldn't be surprised if you saw drives from other vendors in these things. 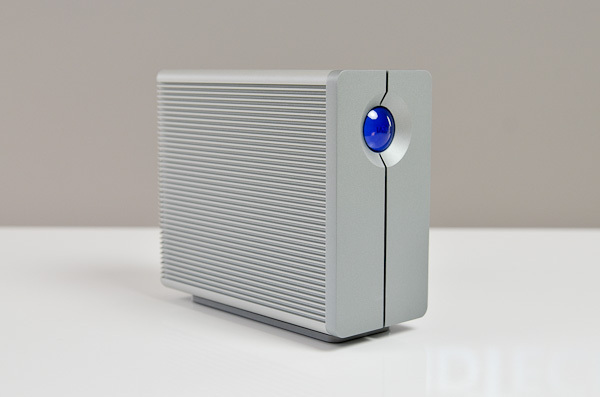 The front of the 2big features LaCie's trademark blue orb that acts as a power switch and power LED (it doesn't pulse during drive activity). The rear is home to the two removable 3.5" drive bays and DC power input. Thanks to the larger size of the chassis, noise isn't an issue. The 2big does have two 3.5" 7200RPM hard drives in it, but the chassis is no louder than you would expect it needed to be. You'll need a coin or a flat head screwdriver to unlock each removable drive bay. Once unlocked the drives slide right out, although the initial resistence of the hotplug SATA connector was pretty significant to overcome. Subsequent removals were easier. The drive bays have an opening big enough for your finger tip to slide in and use as an anchor for pulling out the drives, but there's no quick remove lever to make the process smoother. If you were expecting an enterprise chassis in terms of ease of removing drives, you'll be disappointed. Even the Promise Pegasus' drive sleds were far easier to remove. What you give up in drive swapping simplicity, you gain in build quality. The Promise Pegasus may look good, but it didn't feel like an Apple product. LaCie's 2big is a different story entirely. Build quality is excellent as is seemingly always the case with LaCie. The 2big is built out of thick aluminum, resulting in a very stylish yet functional chassis. If anything the 2big feels over engineered. While I wouldn't recommend dropping it (the drives wouldn't be very happy), the 2big's chassis exudes strength. If you're typically unhappy with the cheap feeling of external drive enclosures, you'll like the 2big. The SSD based Little Big Disk is actually quicker to read from, but write speeds are better on the 2big. Random performance is definitely a strength of SSDs so there's obviously no comparison there. I suspect most external storage is used for storage of large file archives, movies and photos, in which case sequential performance is going to matter the most here. If you are looking to run most of your applications off of the drive however, I would recommend looking at something SSD based instead. Obviously the Pegasus is faster as it has more spindles to stripe IOs across, but I am pleased with the performance you can get out of a 2big. The downside to this performance is, of course, that you have no redundancy within the chassis itself. You can always reconfigure the array to be a RAID-1 (at roughly half the sequential performance and half the capacity) as the 2big simply relies on OS X for software RAID. You can break the array and create a new one using Disk Utility. A normal part of our Thunderbolt test suite is to test compatibility with other Thunderbolt devices, including Apple's Thunderbolt Display. In our Thunderbolt Display Review I noticed an annoying compatibility issue between the Promise Pegasus and Apple's new display. To recap, if you're playing music on the TB Display (via its internal speakers or USB audio connected directly to the monitor) while writing tons of data to the Pegasus you'll eventually get audio corruption. I've also seen issues with keyboard and/mouse inputs during heavy writing to the Pegasus, where keystrokes will just be lost during the copy process. I tried the same test with another Mac connected via Thunderbolt (mounted in target disk mode) in place of the Pegasus and didn't see an issue. I repeated the test with LaCie's 2big in place of the Pegasus and once more, didn't see an issue. I've alerted both Promise and Apple to the issue however I have yet to see a fix. As I alluded to in our Thunderbolt Display review, Promise developed and released the Pegasus before the TB Display was available. 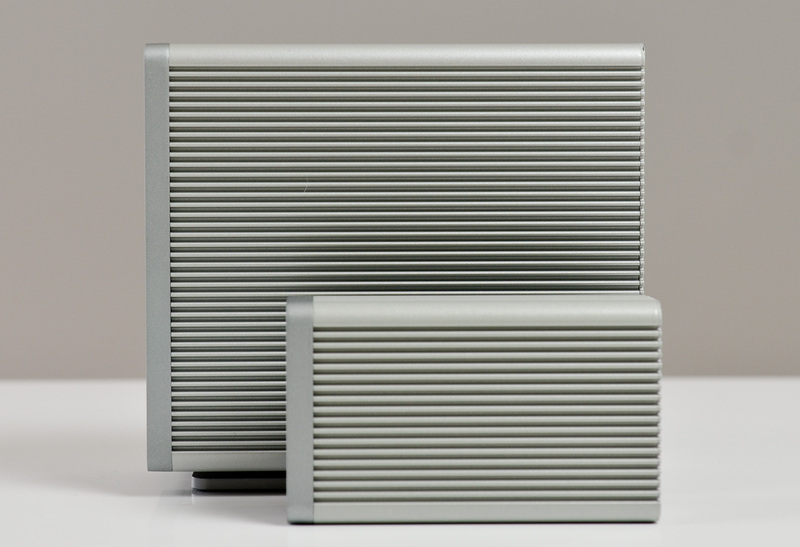 LaCie had the luxury of continuing testing and validation after the TB Display was launched, which likely gave it a bit of a leg up in this department. There's also the question of performance. The Pegasus does deliver around 2x the write speed of the fastest LaCie drive, it's possible that LaCie would have similar problems if it could deliver similar performance. As I mentioned earlier, noise is a non-issue with the 2big. You do have two 7200RPM 3.5" drives inside the chassis so it won't be silent, but I didn't run into the annoying fan noise of the Little Big Disk. Drive temperatures were a non-issue as well, the highest I recorded was 47C after 6TB of writes. LaCie's 2big Thunderbolt series is probably the easiest Thunderbolt solution to recommend as there aren't any obvious issues (other than price). The Little Big Disk is louder than I'd like, and the Pegasus (albeit very fast) has an issue with Apple's Thunderbolt Display. Both of those options have their place, but the recommendations always come with caveats. The 2big on the other hand just gets the job done, although not inexpensively. If you're storing anything super important on the 2big however, you'll still want some sort of a backup solution. 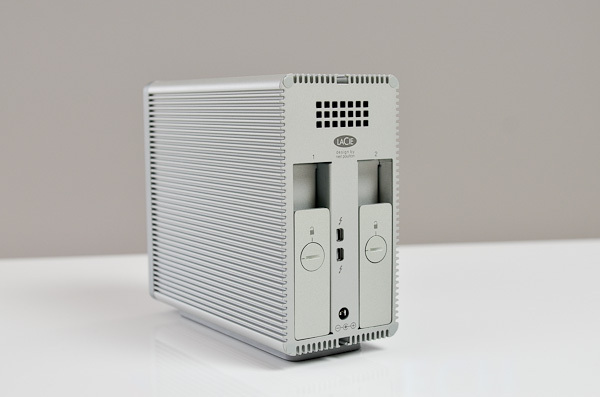 You get good performance (> 300MB/s reads and writes) but that's enabled through the use of a two drive RAID-0. If there's ever a failure in either drive you'll lose all of your data. That is the one significant advantage the Promise Pegasus offers: RAID-5/10 support via 4 or 6 drives. The recommendations break down like this. If you need drive level redundancy and the absolute highest performance, the Promise Pegasus R4 is likely the best option you've got. You can always reconfigure the 2big to be a two drive RAID-1, but you do lose performance in the process. The Pegasus R4 comes with cost and Thunderbolt Display compatibility concerns. If you are using a Thunderbolt Display with the Pegasus, you'll likely want to rely on speakers driven off of your Mac rather than those integrated into the display itself. The Little Big Disk provides an interesting form factor if you need a good amount of storage in a relatively small space. It's still not small/light enough to be something I'd want to carry around, but I do understand the appeal. 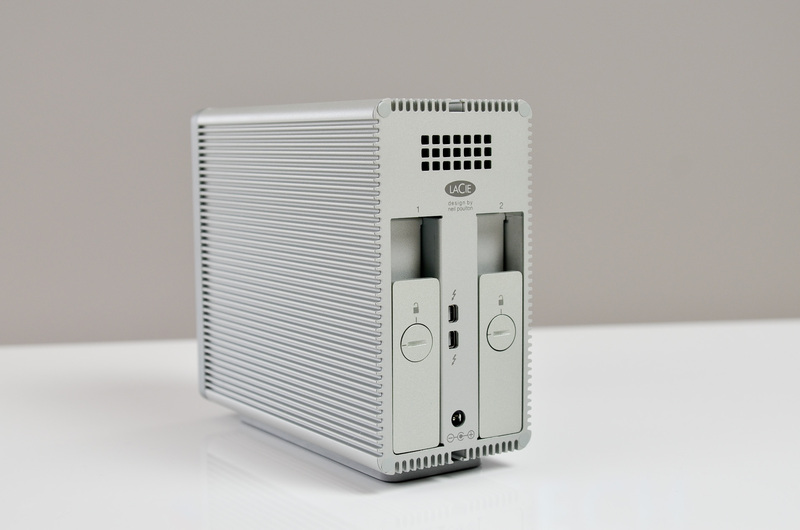 If you don't need the added redundancy or portability however, the LaCie 2big is a great, somewhat more affordable, mass storage Thunderbolt option. Given that it's not hardware-based RAID, any limitation to the flavor of RAID would be in the hands of the OS. Support for RAID5, 10, 20 is only available in hardware-based RAID. Intel's RST is the sole exception, and even that is dependent on the firmware capabilities of their I/O hubs. Given that Intel is the developer of both Thunderbolt and Rapid Storage Technology, I'm interested to see if they will make combined use of both technologies when Thunderbolt starts showing up on PC motherboards. It will also be interesting to see if any of the RAID controller manufacturers produce a RAID card with a Thunderbolt interface to use in conjunction with these external arrays. I looked into it, and OS X supports software 0, 1, and 10, but not 5. Can we hope to see an increase in speed (and maybe lose the Pegasus sound issues) with the arrival of Ivy Bridge and PCIe v3? Logically the available throughput for TB, for a given number of lanes used, should more than double, with the doubling of PCIe bandwidth and the improved overhead. There's several factors at play here. Current Thunderbolt controllers appear to have a single PCIe to Thunderbolt protocol adapter which can handle 10 Gbps of PCIe packets. In order to feed this, the controller has a PCIe 2.0 x4 connection which is good for 16 Gbps. If Intel were to produce a Thunderbolt controller with a second PCIe to Thunderbolt protocol adapter, they would be choking it a bit with only a 4 lane PCIe 2.0 connection to the host, and would have to bump it up to PCIe 2.0 x8 or PCIe 3.0 x4. Two PCIe protocol adapters would be able to max out the current Thunderbolt cable design, and thus more bandwidth on the back end would be useless until they can come up with an even remotely affordable PHY that can handle more than 20 Gbps, full-duplex.